Emma was on stage making connections with loved ones, passing on messages and helping make this time of year a little easier to bear without the ones we love. Unfortunately due to the bad weather on the day there was not a brilliant turn out, however the evening still raised £62.60. 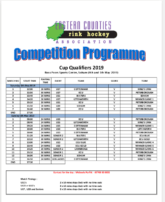 The fixtures list for the 2018/19 Season has been updated to version 6. ecrha.co.uk/wp-content/upl… The ECU Blue U17 tournament has now been rescheduled to Sunday 10th March 2019 from 9:00am to 5:00pm, still at Ross Peers, Soham.